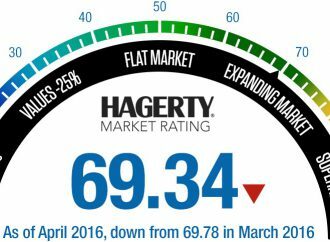 For the ninth time in the past year, the Hagerty Market Rating fell in April. While still in the range of an expanding market, the 69.34-point rating marks a drop of 0.44. 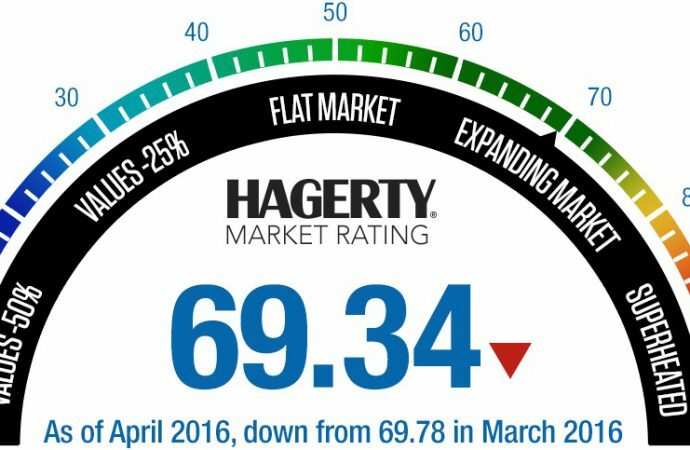 For the ninth time in the past year, the Hagerty Market Rating fell in April. While still in the range of an expanding market, the 69.34-point rating marks a drop of 0.44 points compared with the March figure. “The market is continuing to level out following five years of dramatic increases,” McKeel Hagerty, chief executive of the Hagerty insurance and collector vehicle valuation company, said in a news release. “Overall, post-1960s vehicles and higher-end modern classics continue to show steady strength values. “For first-time buyers, many 1950s and earlier vehicles are excellent entry points into the market,” he added. Pre-1960 vehicles have fallen the most in value, the Hagerty news release noted, on average a 10 percent decrease in sales prices in the past 10 months. Meanwhile, post-1960 vehicles have increased in value by 1 percent during the same period. Another statistic backing up Hagerty’s statement is that owners of pre-’60 vehicles aren’t offering them as often at auction, their presence at collector car sales decreasing 20 percent in the past year. Meanwhile, the number of post-’60 vehicles at auctions is down only 6 percent. While auction activity increased slightly in the March ratings, it dropped significantly in April’s report, the Hagerty news release noted, both in the number of cars sold and the median sale price. Also declining, to a 19-month low, was the number of requests for insured value increases among broad-market vehicles. However, requests for insured value increases among high-end vehicles increased. Hagerty reported that in the past year, high-end modern classics have generated a 70 percent increase in the number of value increase requests by their owners. The news release noted that it was external market forces that accounted for the biggest increase in the Hagerty Market Rating for April as Correlated Instruments rebounded after a significant decrease; the S&P 500 climbing past the 2,000 mark and gold prices falling slightly. Further, the rating for March was revised from 69.87 to 69.78 when recently released inflation figures were considered. The Hagerty Market Rating is based on a weighted algorithm that considers 15 proprietary data points in eight categories, including public auction and private sales, values of insured cars, price-guide values, Hagerty’s own index system and input from industry experts. The rating, reported at the middle of each month, is based on a 100-point scale and is presented in the form of a tachometer-style gauge, complete with a “superheated” red zone, a sort of warning that we’re approaching a possible burst of the bubble. Ideally, the market cruises along comfortably in the 60- to 80-point “expanding” zone. Although first released in January 2015, Hagerty applied its formulas to the classic car marketplace dating back to January 2007. The rating then was in the low 60s. During the economic recession, it slumped to the high 40s and has been on an upward trend since late 2010.